DO NOW 1.If you have your cards in your bag, take them out! 2.NOTES TODAY! 3.Take out your essay for me to collect. IF YOU DO NOT HAVE AN ESSAY, I WILL. 1 DO NOW 1.If you have your cards in your bag, take them out! 2.NOTES TODAY! 3.Take out your essay for me to collect. IF YOU DO NOT HAVE AN ESSAY, I WILL COLLECT A PIECE OF PAPER WITH YOUR NAME ON IT. 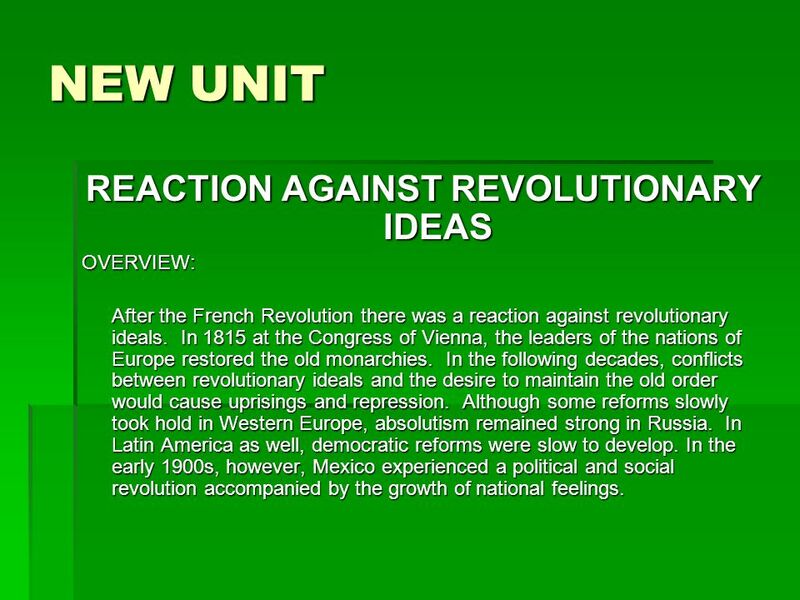 3 NEW UNIT REACTION AGAINST REVOLUTIONARY IDEAS OVERVIEW: After the French Revolution there was a reaction against revolutionary ideals. In 1815 at the Congress of Vienna, the leaders of the nations of Europe restored the old monarchies. In the following decades, conflicts between revolutionary ideals and the desire to maintain the old order would cause uprisings and repression. Although some reforms slowly took hold in Western Europe, absolutism remained strong in Russia. In Latin America as well, democratic reforms were slow to develop. In the early 1900s, however, Mexico experienced a political and social revolution accompanied by the growth of national feelings. 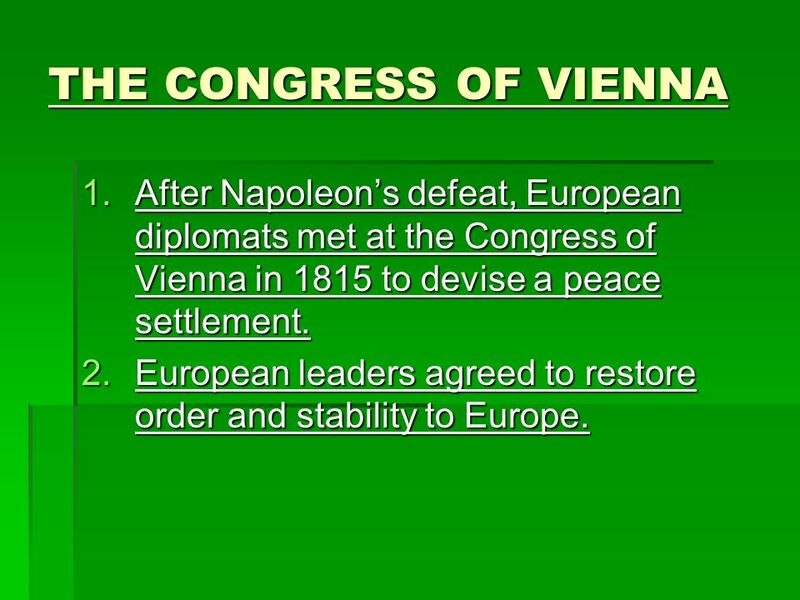 6 THE CONGRESS OF VIENNA 1.After Napoleons defeat, European diplomats met at the Congress of Vienna in 1815 to devise a peace settlement. 2.European leaders agreed to restore order and stability to Europe. 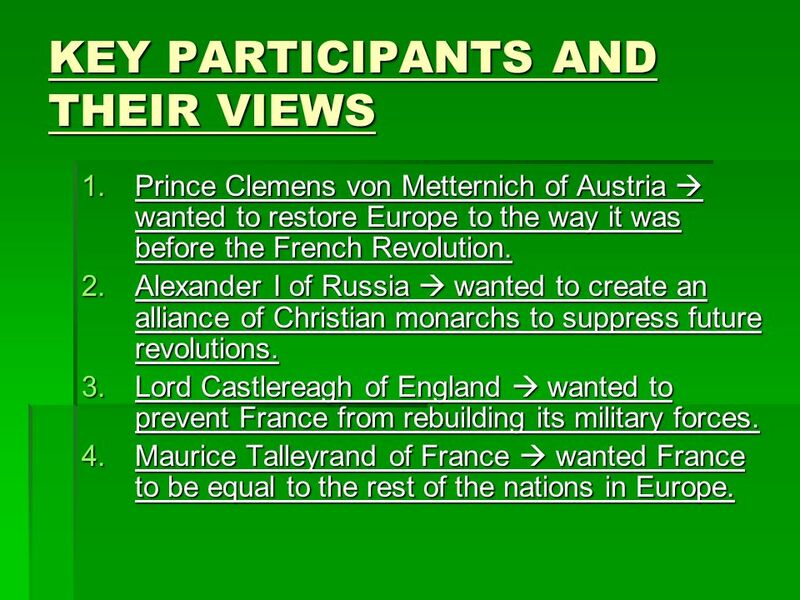 7 KEY PARTICIPANTS AND THEIR VIEWS 1.Prince Clemens von Metternich of Austria wanted to restore Europe to the way it was before the French Revolution. 2.Alexander I of Russia wanted to create an alliance of Christian monarchs to suppress future revolutions. 3.Lord Castlereagh of England wanted to prevent France from rebuilding its military forces. 4.Maurice Talleyrand of France wanted France to be equal to the rest of the nations in Europe. 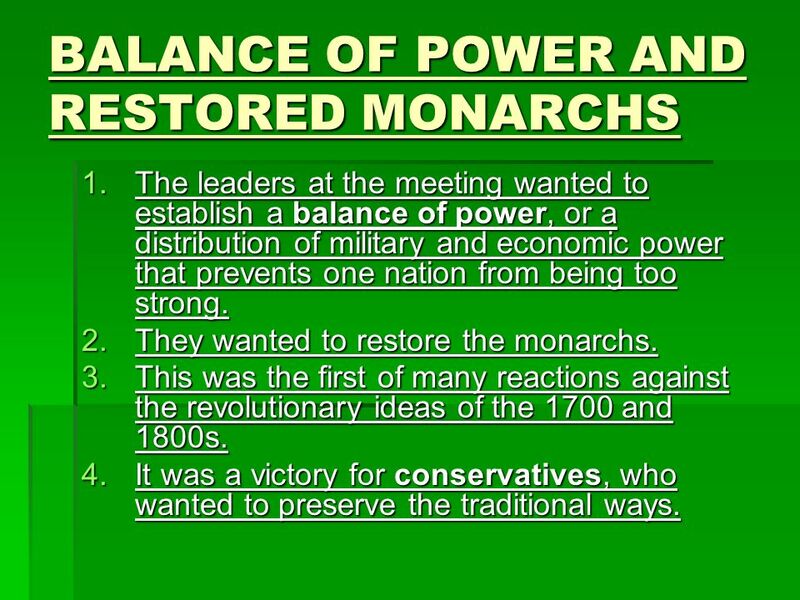 9 BALANCE OF POWER AND RESTORED MONARCHS 1.The leaders at the meeting wanted to establish a balance of power, or a distribution of military and economic power that prevents one nation from being too strong. 2.They wanted to restore the monarchs. 3.This was the first of many reactions against the revolutionary ideas of the 1700 and 1800s. 4.It was a victory for conservatives, who wanted to preserve the traditional ways. 10 See how the map changes! 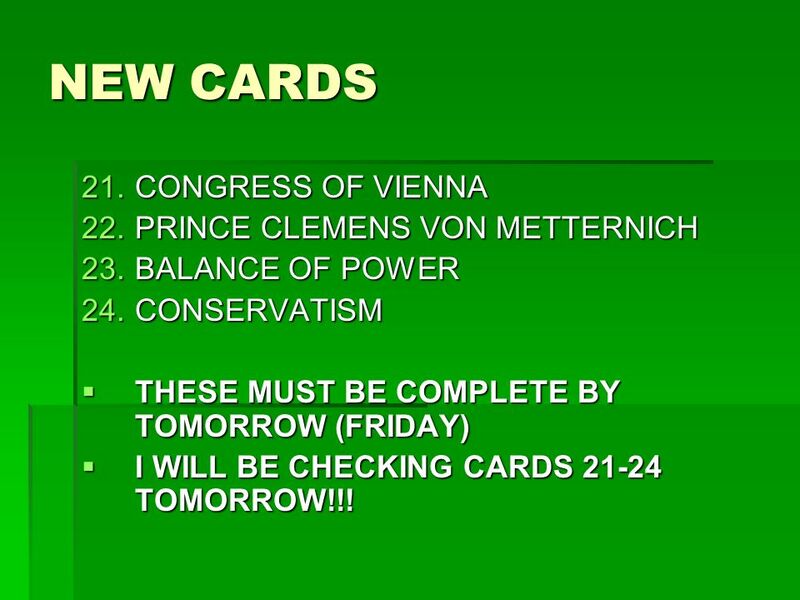 11 NEW CARDS 21.CONGRESS OF VIENNA 22.PRINCE CLEMENS VON METTERNICH 23.BALANCE OF POWER 24.CONSERVATISM THESE MUST BE COMPLETE BY TOMORROW (FRIDAY) THESE MUST BE COMPLETE BY TOMORROW (FRIDAY) I WILL BE CHECKING CARDS 21-24 TOMORROW!!! I WILL BE CHECKING CARDS 21-24 TOMORROW!!! 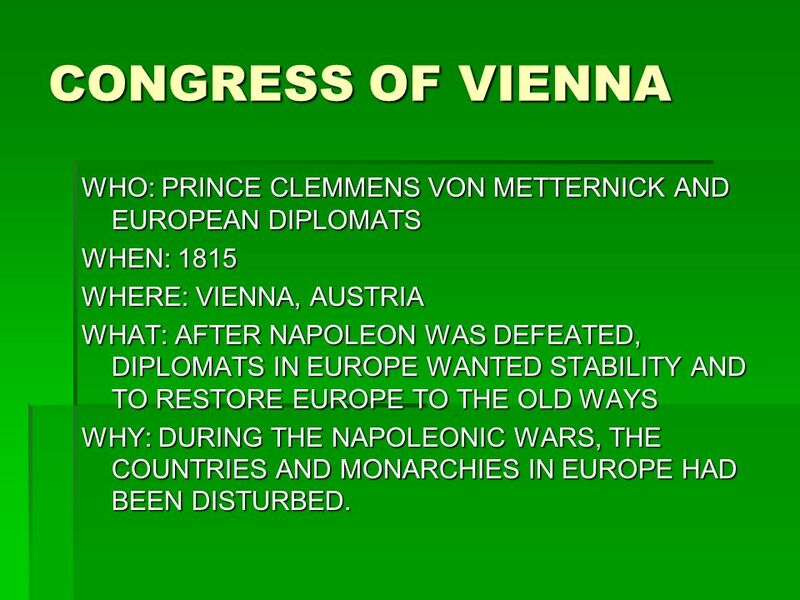 12 CONGRESS OF VIENNA WHO: PRINCE CLEMMENS VON METTERNICK AND EUROPEAN DIPLOMATS WHEN: 1815 WHERE: VIENNA, AUSTRIA WHAT: AFTER NAPOLEON WAS DEFEATED, DIPLOMATS IN EUROPE WANTED STABILITY AND TO RESTORE EUROPE TO THE OLD WAYS WHY: DURING THE NAPOLEONIC WARS, THE COUNTRIES AND MONARCHIES IN EUROPE HAD BEEN DISTURBED. 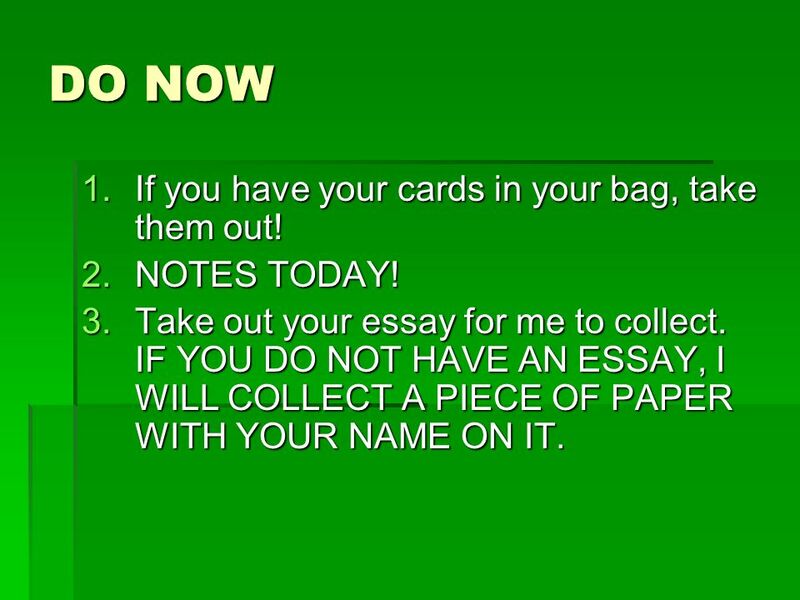 Download ppt "DO NOW 1.If you have your cards in your bag, take them out! 2.NOTES TODAY! 3.Take out your essay for me to collect. IF YOU DO NOT HAVE AN ESSAY, I WILL." 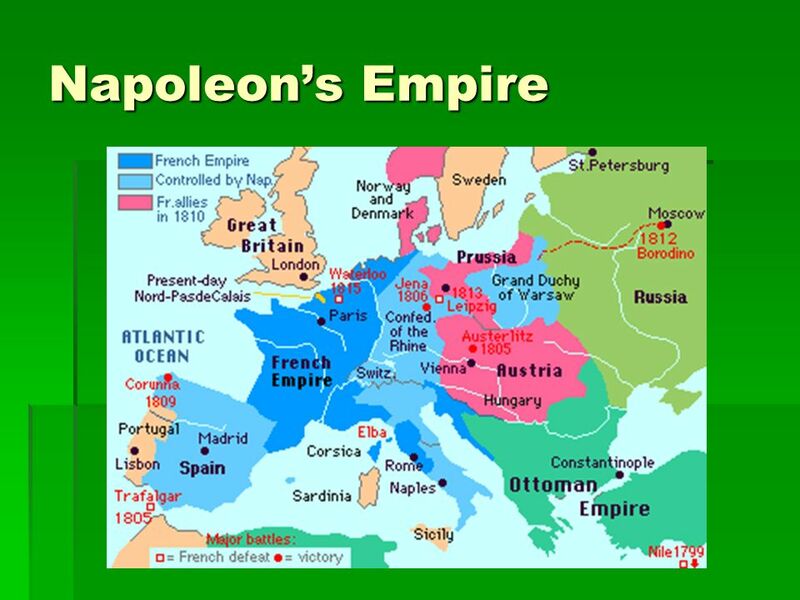 After Napoleon was exiled, the nations that made up the Grand Alliance met to decide the fate of European nations (Austria, Britain, Prussia, and Russia). Warm Up Answer the following questions based on the map, Revolutions in Europe, 1848 (p. 594): a. Which revolution site lies closest to the 40 degrees. Putting Europe Back Together: Congress of Vienna (1815) Special Thanks to Ms. Stewart. The Congress of Vienna Congress of Vienna Concerned about the spread of nationalism and ideas of the Rights of Man spread by the. 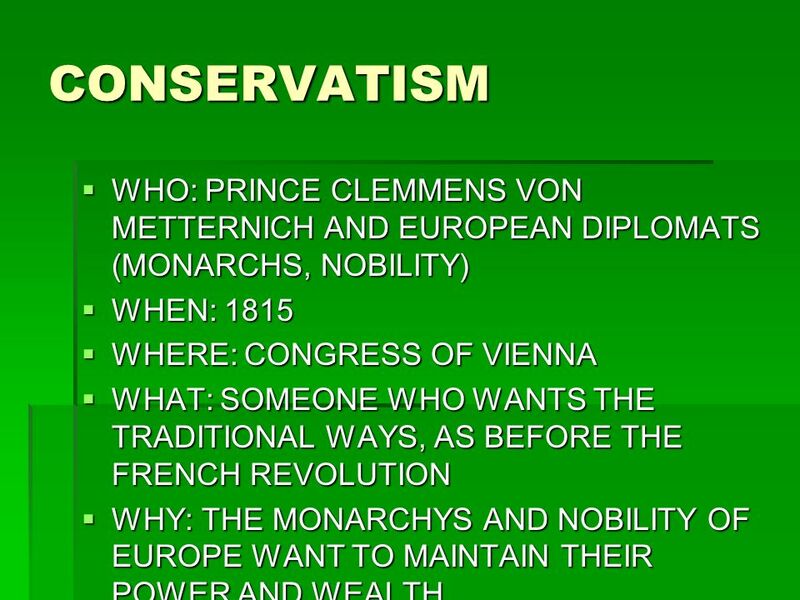 The Congress of Vienna Chapter 7 Section 5. 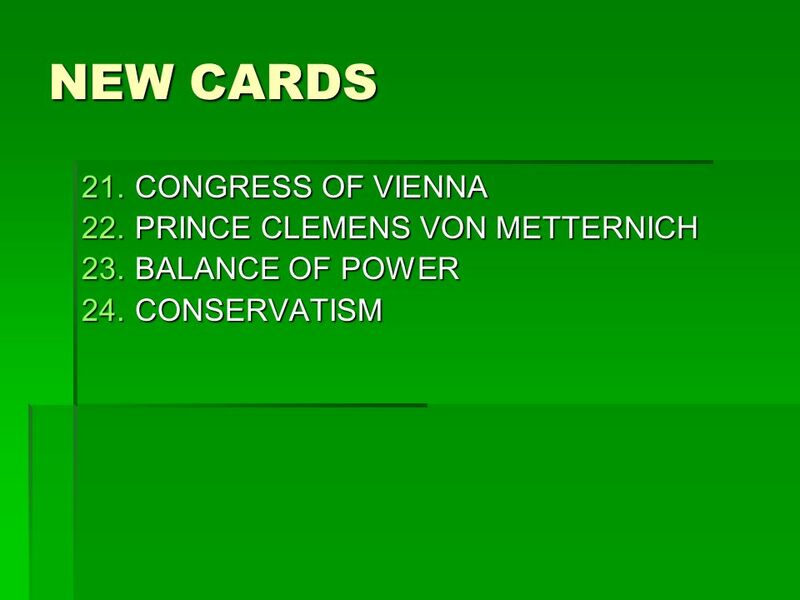 Aim: What Were the Goals of the Congress of Vienna? 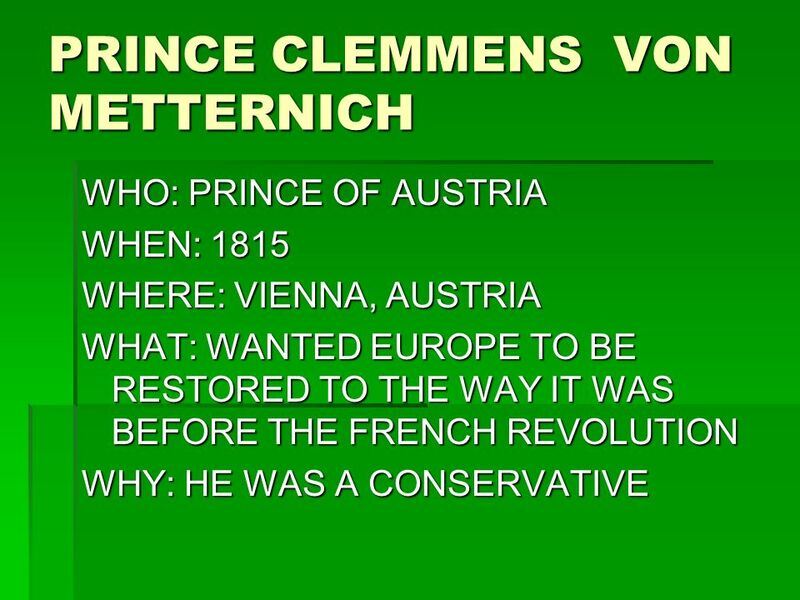 Klemons von Metternich organized an international system that “turn back the clock” and restored much of the Old Regime. The Metternich System. Politics in 19 th Century Europe: Growth of the Political Spectrum November 16, 2009. 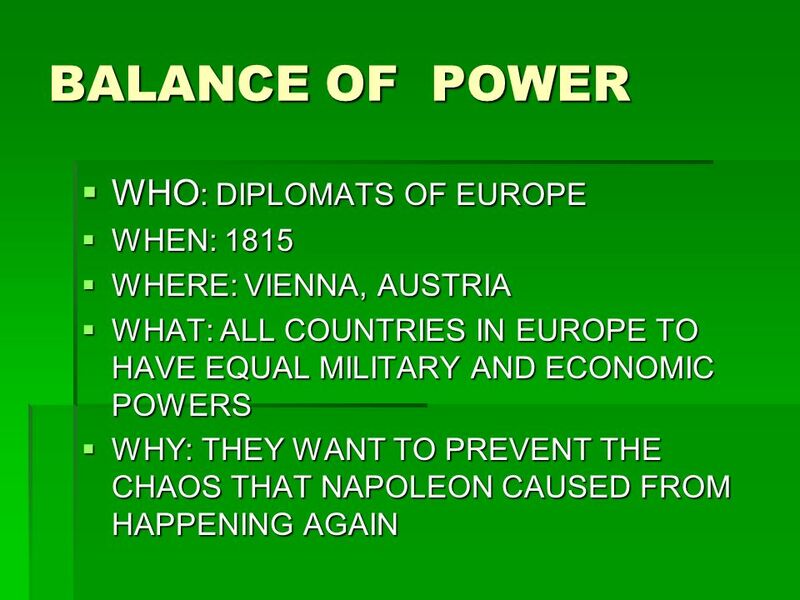 A Return to Peace Ch 12 Sec 5 The Congress Of Vienna  Many European Monarchs feared the revolution of France. Ideas of Liberty, Equality and Fraternity. What do you think makes a nation a nation? When is it legitimate to call a nation one? The Congress of Vienna. 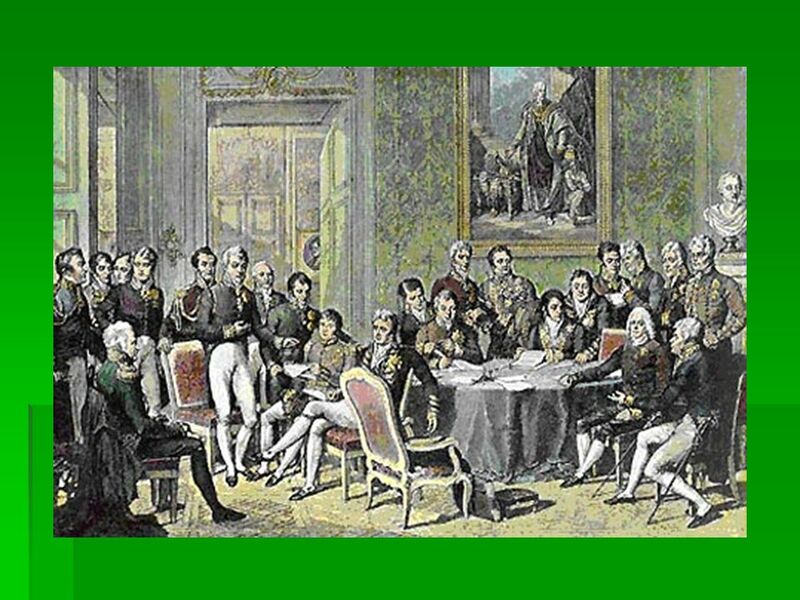 Congress of Vienna Meetings for a European peace plan so no wars ever break out again (1814 – 1815). The goal of the Congress.